The city of Sydney comes with an extremely well-developed transport network and organised infrastructure, with a sizeable bus service providing the easiest way to travel into surrounding suburbs such as Arncliffe, Drummoyne, Greenwich, North Bondi, Pagewood and Willoughby. 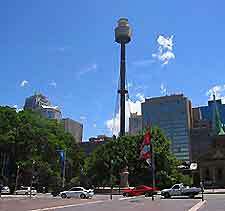 Many popular buses tend to depart from the Circular Quay and other prominent stops around Sydney. Of note, both buses and ferries around the city are provided by the STA (State Transit Authority of New South Wales). For short distances, taxis and the light rail service are both competitively priced, while monorail transport is also available for tourists looking to reach Darling Harbour. 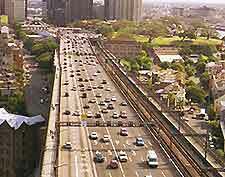 Those wishing to travel a little further afield may like to hire a car when arriving at the Kingsford Smith International Airport, or perhaps make use of the state's extensive railway connections. If you are planning more than just a couple of days' worth of travelling, then the Sydney Pass will likely be a worthy investment, providing unlimited travel onboard all STA transport, along with train routes within the inner suburbs (the TravelPass Zone). Those intending to use solely buses may find that simply purchasing a booklet of ten tickets (Travel 10) may be the best-value option, depending upon your plans. The city is served by the Sydney Kingsford Smith Airport (SYD). Renting a car can be an economical way to travel around New South Wales, with some firms offering discounts for rentals of three days and over. 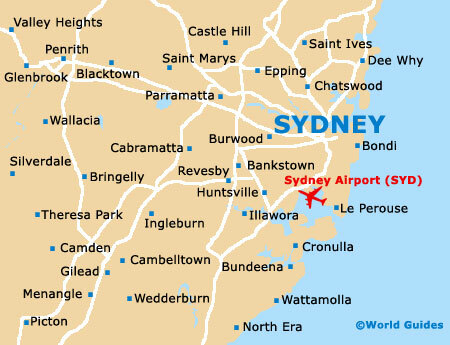 Major car rental companies at Sydney Airport include Avis, Budget, Europcar, Hertz, Redspot Rentals and Thrifty. Some hire companies will include both insurance and unlimited mileage within the price, although often require that drivers are aged 25 years or over. Starting to the south of the Sydney Opera House, the harbour tunnel heads beneath the water and was designed to share the workload of the bridge. Those driving in a southerly direction, either through the tunnel or over the Harbour Bridge, will need to pay a toll. Book your Sydney Car Rental here. Sydney is well served by buses, which travel throughout the entire city and within the suburbs, up to 50 km / 30 miles away. Buses are available for inner-city tourist attractions, with well-placed sightseeing stops at convenient points. Bus transport runs between the hours of 05:00 and midnight, with a Nightrider service taking over from midnight onwards. Popular stops can be found at the Circular Quay, at Millers Point, on the Railway Square, on York Street and at Wynyard Park. Bus fares are purchased from the bus driver, although prepaid tickets can be bought ahead of travel. Discount ticket options are available and further information about the latest offers can be gleaned from the information kiosks on the corner of Albert Street and Pitt Street (Circular Quay), as well as within the Queen Victoria Building situated on York Street. Ferries travel up and down Sydney Harbour all day and many commuters use this ferry transportation, while tourists may enjoy the sightseeing along the way. Departures are from Circular Quay and visitors may wish to purchase ferry-and-entrance fee tickets to some of the attractions, which generally works out cheaper. The CityRail train service covers many of the suburbs, as well as central Sydney, with close to 200 different stations along almost 900 km / 560 miles of track. This service runs from early morning - 05:00 until midnight, with cheaper off-peak tickets being offered for purchase during the week, after 09:00. The Central Station is the main railway terminus for local and interstate travel, with underground City Circle trains connecting a series of centrally located stations. The Metro Light Rail offers an efficient mode of transport for tourists, with a 7-km / 4-mile route linking popular destinations such as the city centre, Darling Harbour, Lilyfield and Pyrmont. There is also a new extension heading between the suburbs of Dulwich Hill and Lewisham. This service operates 24 hours a day, with trams running approximately every five to ten minutes. Fares are purchased on board the trams. Daily or weekly Light Rail travelcards can be purchased, offering good value for money. Travelling around Sydney by monorail is a most enjoyable mode of transport for tourists and this service runs between the city centre (near the Town Hall) and Darling Harbour. The service operates approximately every three to six minutes, between the hours of 07:00 and 22:00. Taxis in Sydney are an economic option for shorter journeys and ideal if you are looking to get back to your hotel late at night. It is generally quite straightforward to flag down a taxi in the Central Business District, while various ranks are conveniently available in prominent places. Taxis can be very hard to come by on Friday and Saturday evenings, and so even if you have phoned and arranged a pickup in advance, you may be in for quite a wait. Fares are calculated using daily or nightly rates, with booking fees and waiting rates (when stationary or in slow-moving traffic) also added to the fare where applicable. Those headed over the Harbour Bridge or through the tunnels will also need to pay the tolls, regardless of direction.